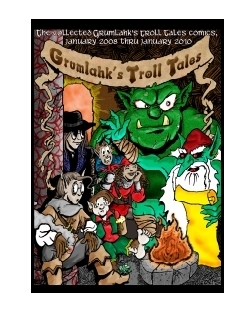 Grumlahk's Troll Tales, the collected comics as they first appeared in the Tunnels & Trolls gaming magazine "The Hobbit Hole". There's a wacky bunch of characters here including hungry ogres, rogue elves (including a blind elf assassin! ), terrible monsters, and more! Proceeds from sales of Fabled Worlds games go directly to The JeffWerx Transplant Fund to make a life-saving kidney transplant possible. For more information visit www.jeffwerx.com. Thank you for your support. This title was added to our catalog on December 24, 2009.